Traditional coonskin hat at worn by Daniel Boone, Davy Crockett, pioneers, and fur trapper. This hat is perfect for the Lost Boys in “Peter Pan”. 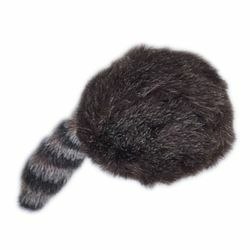 This hat is made of quality imitation raccoon fur with a faux fur tail. One size fits most up to a 23” head measurement.